You can listen to 'A banquet for ghosts' here. The cover of A banquet for ghosts is well chosen. A vague figure of a woman in the mist. She obviously very thin. A ghost on the way to a banquet? Starved? Is there anything lurking just beyond where we can see 20/20? Is she walking on water? Veiled light, a shaded world. Nothing like that as far as Matthew Mayfield is concerned. He has released a beautiful album. A gem full of rich material, that is offered to the listener. Only last week I had never heard of Matthew Mayfield. A banquet for ghost is one year old at the end of May. When listening to Patrick Joseph's EP 'Foot in the door' (read our review here) this album was presented to me as a free download. An ooportunity I decided not to let pass by. At first listening I was already impressed. Mayfield's voice is soft, he sings restrained, but unleashes in the roughly sung and played 'Track you down'. In a song like this his voice reminds me of one of my favourites in the Americana side of music, Grayson Capps. Other times it's Counting Crows' Adam Duritz. The music is intense and well produced, sparingly with distinct accents, laying the drama on in all the right places. At times creating an atmosphere like fog does. When sounds are muffled and that it's hard to tell what I'm actually listening to. These little sounds in the background, just the stroke on the snare of a guitar? The general mood is beautifully captured by the cover. I'll get back to that later. Matthew Mayfield is from Birmingham in Alabama. He first played in a band called Mozes Mayfield, but since 2008 he's active as a solo artist. So far he has released six EPs and two albums. This is his second. His latest EP has just been released I found out. For me A banquet for ghosts is my first exposure to his music, as you've already gathered. A banquet for ghosts is not a pleasant album. Do not expect happy tones. Life is a serious if not an unhappy matter. There is a strong longing and expressions of loss and pain on this album. 'Carry me' is a beautiful example of this. A lone pedal steel guitar, sparse piano notes, a desolate "o, o, o" sung from far, far away. This song is extremely good in all its bare facets. 'Track you down' is a song with 'Melody' like lyrics, musically it is closer to Jack Johnson, but with a dark gloss that does not exist in Hawaii. The muted lead lines on the guitar in the chorus, the creepy violin solo, the haunting voice. A spine tingling great song! A song that creeps up on the listener. The intensely sad atmosphere would make any other album album too much to listen to. Matthew Mayfield comes up with 'Beautiful' to counter that feeling. Again a violin and more strings are put in, giving 'Beautiful' it's own private, unique moment. 'Safe & sound' takes the mood down even further. Mayfield seems to hit rock bottom here, having lost, but wishing the other the best, "safe & sound". With again these ghost sounds in the background. What am I hearing? A voice? An instrument? Just creaking? 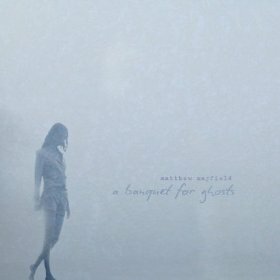 A banquet of ghosts is an album that brings the listener very close to Matthew Mayfield. He shares his deeper, perhaps deepest emotions with you. It takes some perseverance, but what you get in return is sheer beauty. Does an artist have to suffer to create at his peak? Who knows, but A banquet for ghosts is an extremely beautiful album. One that does not come by every day.